Today's entry here on Blogger is part two-G-2 of a series of posts pertaining to a year-end review for special occurrences in my urban garden for the year 2012 (the schedule for this series is described in part one as well as part two-A of this topic) and, because September 2012 was the month when my garden went through so much upheaval, I will be posting the review for that month in two parts. 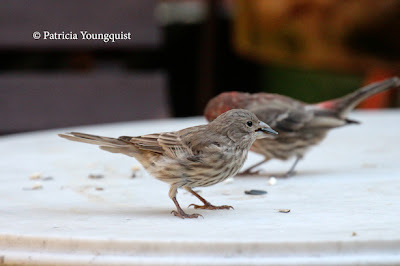 The first part of September (September 1st — September 11th) was discussed in yesterday's post. In today's entry I will be reviewing events that took place in the month of September during the time period of September 12th through September 20th for the year 2012, and I will begin by referencing the photograph above which illustrates the fact that in spite of the various losses in my garden, my bling wearing (ankle bracelet or a branding bracelet) house finch was continuing to come back to my garden. 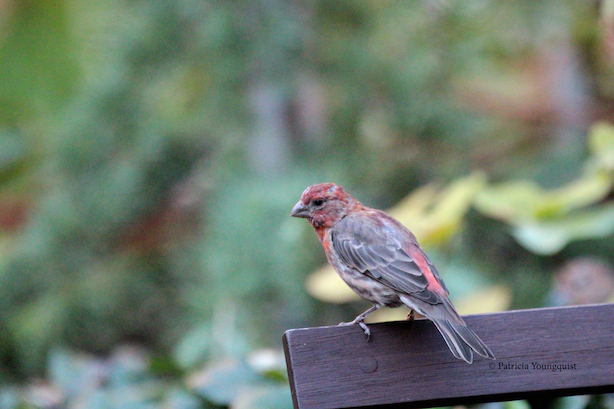 I ended yesterday's post with a different image of her (one from September 11th of 2012) and I begin today's post, featuring her checking out the foliage of my 'Tamukeyama' (AKA Japanese Red Maple), where she may have been pondering Robert Frost's words re seeing "a poem lovely as a tree." 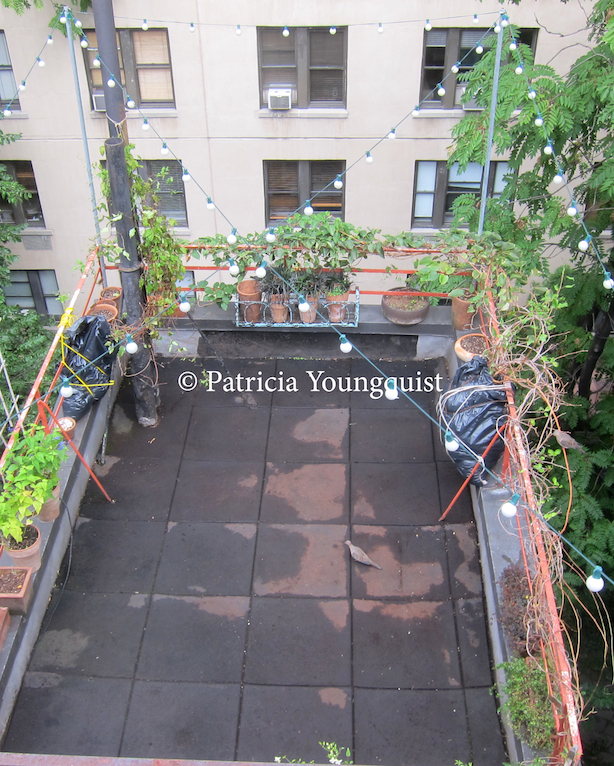 And when she wasn't spending time contemplating Robert Frost, she hung out with one of my Hens and Chicks as seen in the image below. 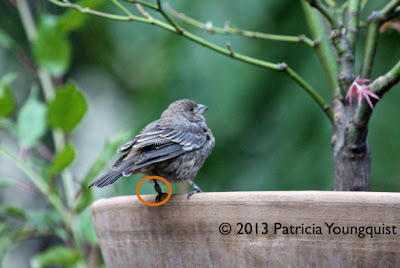 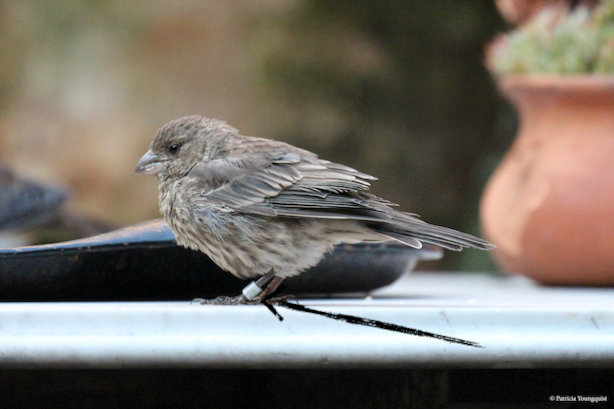 In any event, in the image atop today's blog entry, my house finch's "ankle bracelet" is indicated my an orange circle which has been superimposed over the image and in the second image of her, the bracelet is indicated by a black arrow which has been superimposed over the image. 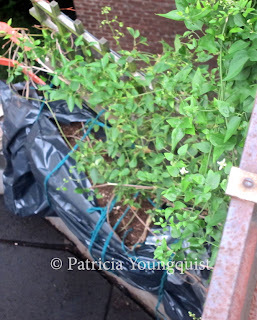 As far as the "fate" of what I grow in my garden re the time period of September 12th 2012 though September 30th 2012, I'll pick up with where I left off in yesterday's post which was with the "fate" of my herbs for the 2012 growing season. I had explained that I was "forced" to un-pot all my herbs to accommodate the "so-called" renovation (re-surfscring of m garden's "floor") which was scheduled, according to my landlord, to take place "sometime in September of 2012." 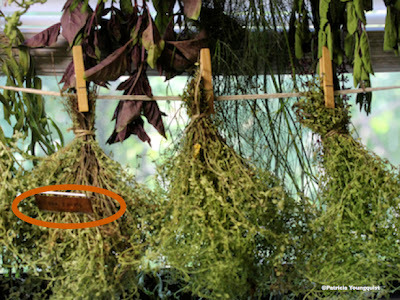 In any event because Juan V had un-potted the herbs as I described in my post yesterday, my next step was to hang the to dry so I could give them to friends. My drying method can be seen in the image posted below. The item you see circled in the image is one of my garden name tags, a pending project known as The Name Tag Project, which has continued to be moved from one back burner to the next! 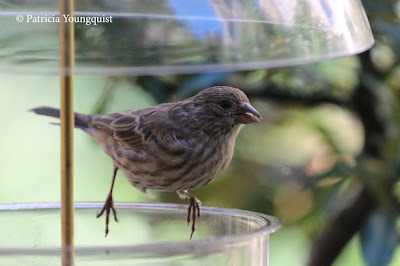 And what a crowded back burner it was, for as you can probably imagine, even the thought of my having to remove 80+ things which I grow (as well as their containers) that require the outdoor conditions which "normally" occur in my garden to a temporary location was overwhelming — nearly akin to placing 80+ children in foster care or 80+ pets in temporary shelters! 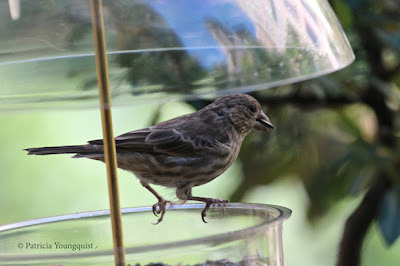 The aforementioned is just part of what was on my mind the morning of September 12th 2012, whilst my finch contemplating Robert Frost and interacted with my hens and chicks plant. 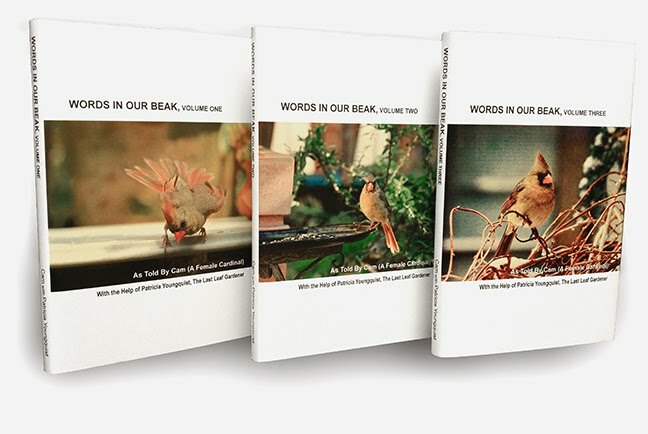 It has been written, "Consider the birds, they do not sow or reap," and on that day re my many concerns, I could've taken a lesson from my array of visiting birds who appeared to be living life to the fullest — and in the moment too — as evidenced by a select few of many of the images taken of them (posted below) in days spanning September 12th 2012 through September 19th of 2012, the day I had to move everything off my garden's "floor!" 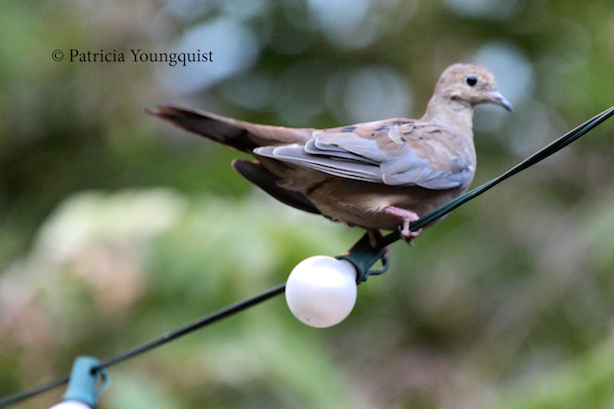 MOURNING DOVE DOING "CHIN-UPS" ATOP MY STRING LIGHTS! 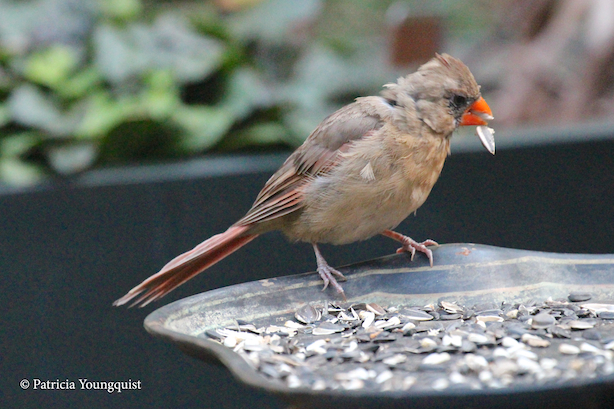 CAM (MY BELOVED CARDINAL) RETURNS AND CHECKS OUT YOURS TRULY! 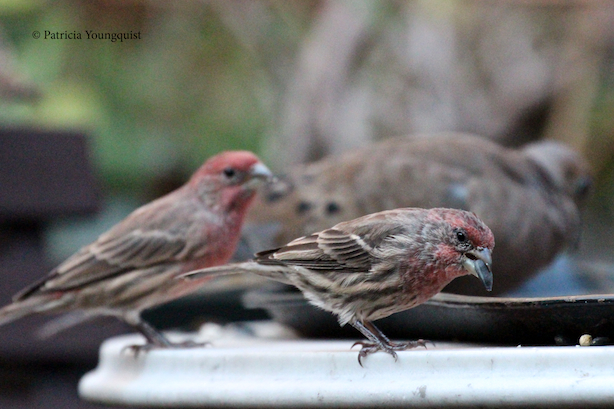 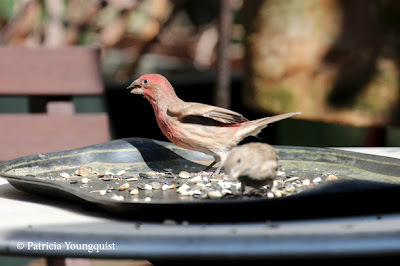 MALE & FEMALE FINCHES ENJOY SNACK TIME! FEMALE FINCH ENJOYS MY 'TAMUKEYAMA'S BRANCHES! 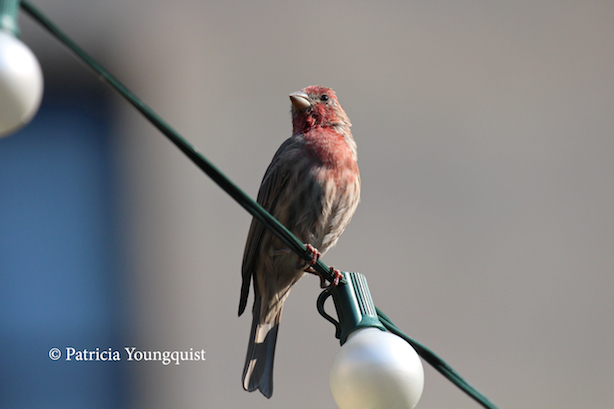 MALE HOUSE FINCH CHECKS OUT MY "HOOD" FROM ATOP MY STRING LIGHTS! 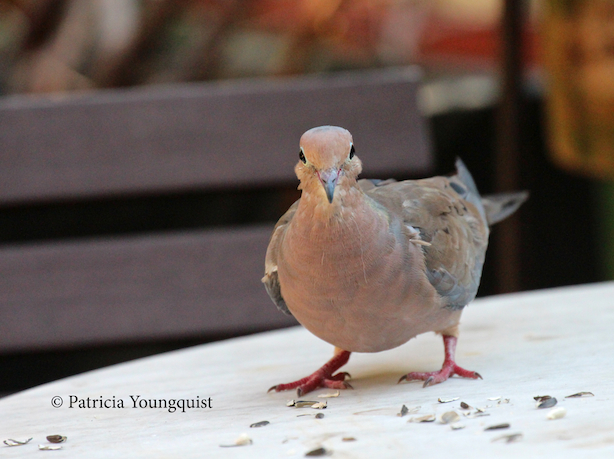 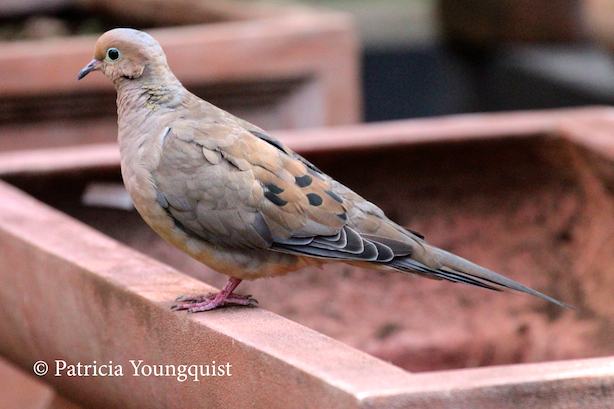 MOURNING DOVE MUGS FOR CAMERA! MALE & FEMALE FINCHES BASK IN SUN AND ENJOY SNACK TIME! CAM ENJOYS THE TWISTING ANDC TURNNG BRANCHES OF MY CONTORTED HAZELNUT! FINCH DECIDING WHAT TO HAVE FOR DINNER! CAM "GRABS" FOOD AND MISSES HER BEAK! 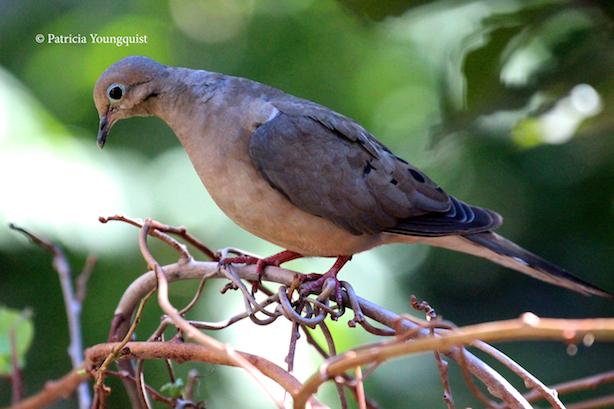 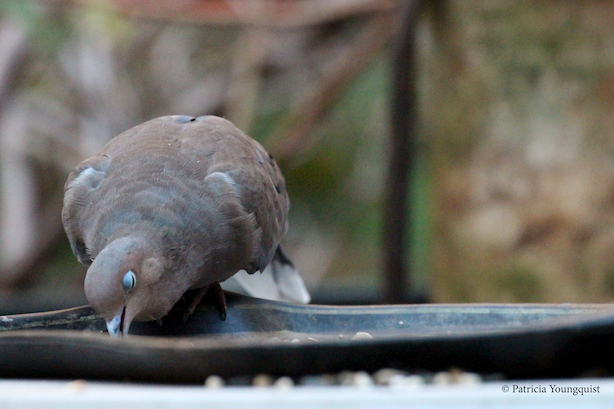 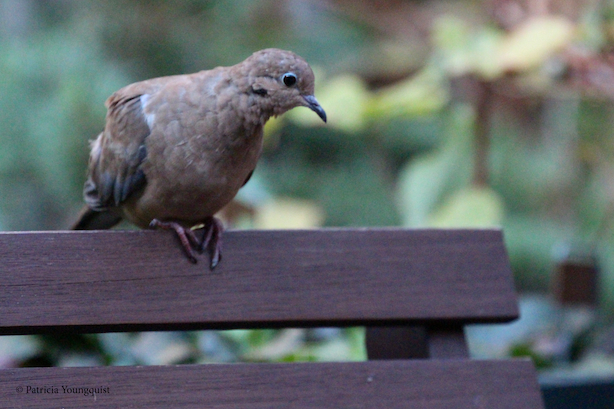 MOURNING DOVE WONDERS WHAT HAPPENED TO MY KIWI'S FOLIAGE! 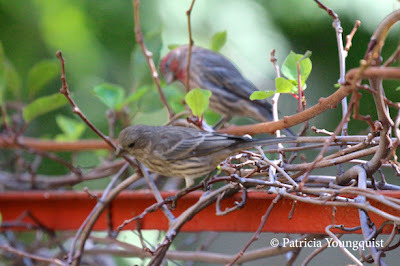 HOUSE FINCHES WONDER WHAT HAPPENED TO MY KIWI'S FOLIAGE! 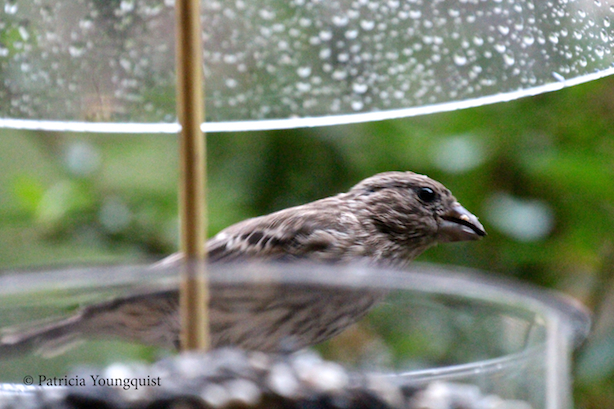 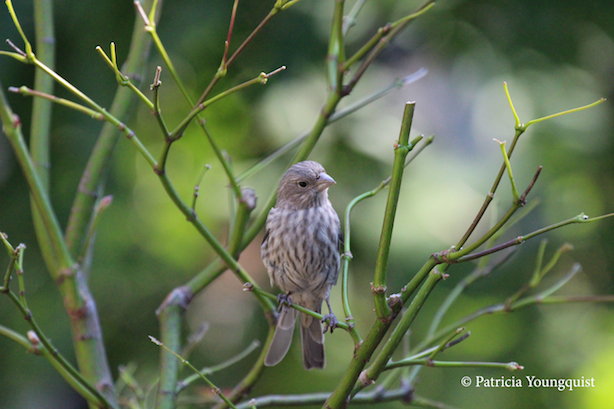 HOUSE FINCH PLAYS PEEK-A -BOO WITH YOURS TRULY! 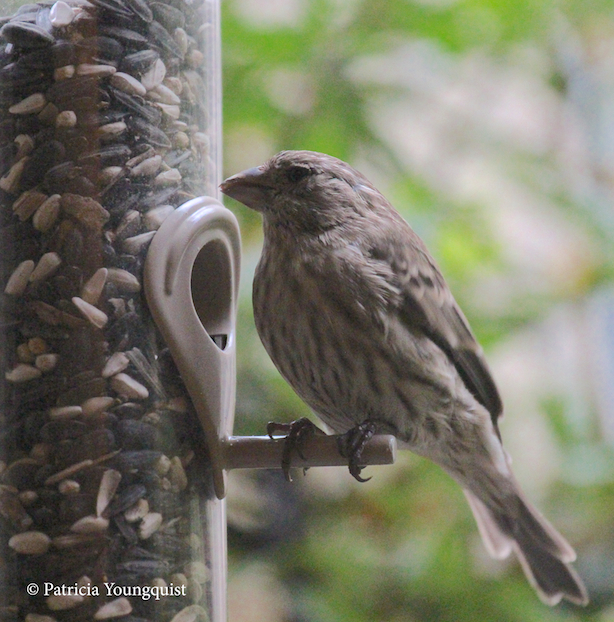 And also during the time period covered by the aforementioned images, my visiting birds got acquainted with a dome style feeder (which can protect rheir food in the rain) that had been put in my garden by a friend. A few photo-ops are posted below. 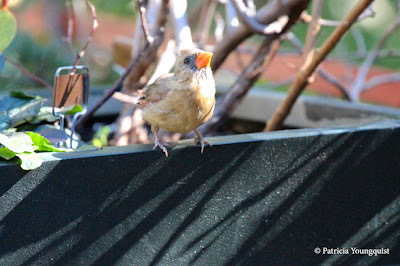 Also during the time period in which I took photo-ops of my birds, I was able to prepare for my inevitable "renovation" by moving some of the "things" I grow to Michael's garden, but the exposure to sunlight etceteras that he has is totally the opposite of mine and I was worried what I moved there would either deteriorate from shock or die! Moreover, some of what I grow I've had for over ten years! 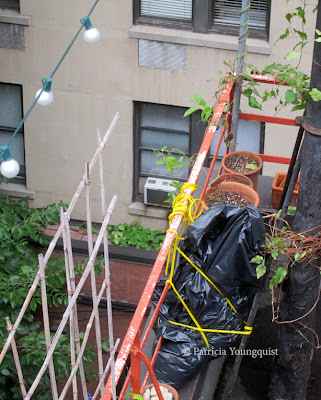 Besides the realization that moving things to Michael's garden could result in either catastrophe; the thought of carrying potted containers of flowers, grasses, plants, trees and shrubs down 70 stairs; and then across nearly one city block and down another flight of stairs to accomplish this "task" exhausted me! 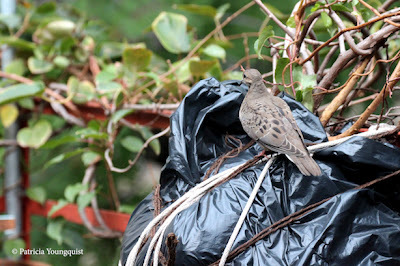 Be that as it may that was the plan I ultimately fulfilled, and with Michael's help, I was able to move about twenty living "things" to his garden, hoping they would survive in their temporary location; and I was most grateful! 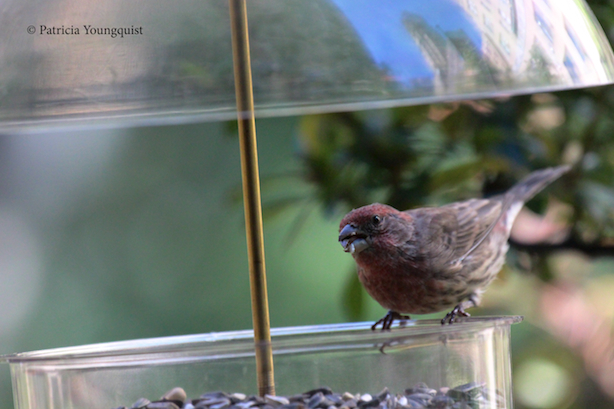 Also, I would need to provide accommodations for my shrubs and ornamental grasses. My shrubs include an Avellana corylus (AKA Contorted Hazel Nut); a Continus Coggygria (AKA Smokey Bush, Royal Purple or 'Grace'); a Paeonia suffruiticosa (AKA Tree Peony), a Blue Shag; and a Thom Thumb Shrub; while my grasses include a "the twins" which are known as Hakanechola Macra (AKA Japanese Forest Grass) and a set (triplets) of Ophipogon planiscapus (AKA Black Mondo Grass). 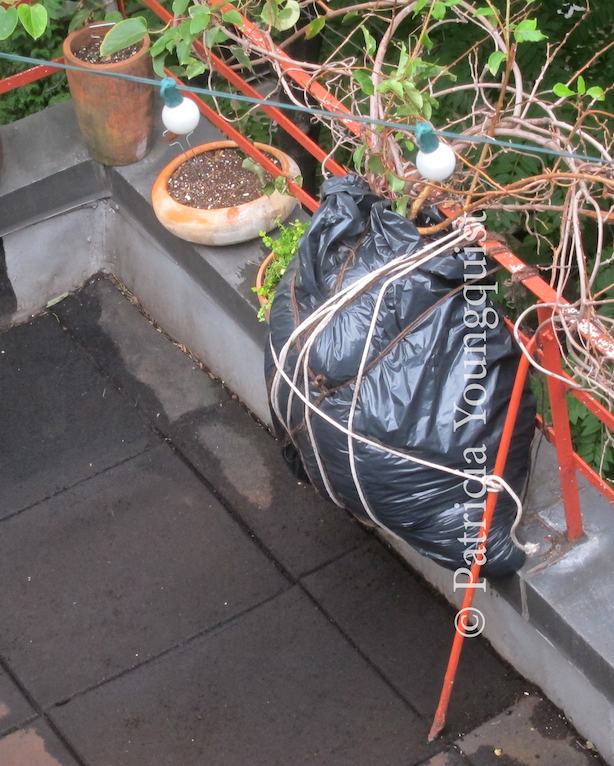 As for my five vines, two of them, my Rubus calycinoides (AKA Creeping Raspberry or Ornamental Raspberry) and my Vaccinium macrocarpon (AKA Cranberry Vine also needed to be brought inside, but the other three, my Actinida kolomikta and Actimida (AKA Kiwi Vines) as well as my Autumn Clematis (AKA Donna's Legacy), and my H.F.Clematis would have to be removed from their respective containers, put into heavy bags and tied to the railing that wraps around my terrace. 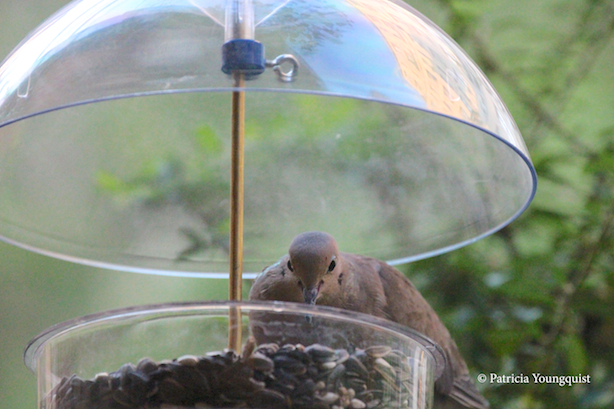 My need to do this was because I had to have everything off my garden "floor." 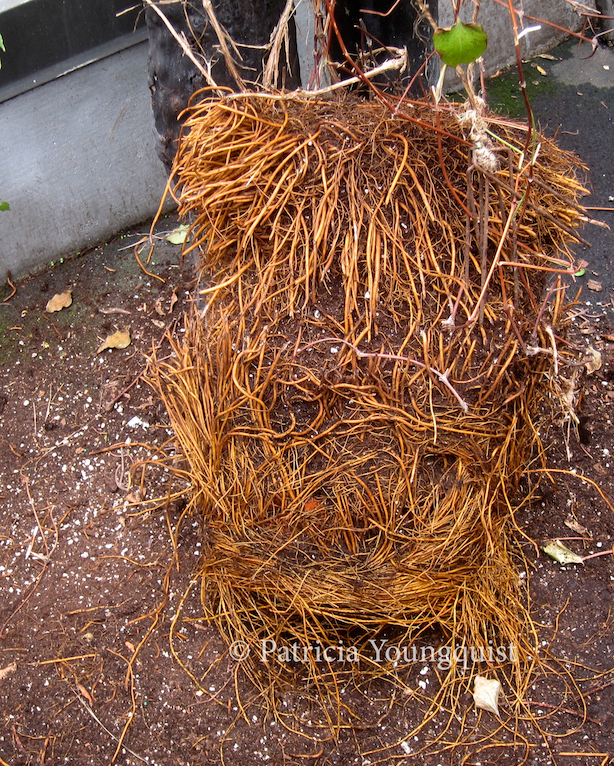 Having to uproot my vines was a bit distressing as the kiwi had only been moved into a bigger container in May of 2012 and, moreover, it was still suffering from being attacked by a mold as described in yesterday's post! 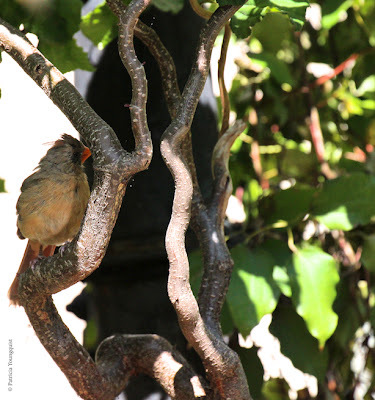 And, I was concerned that Cam would not have a place to catch her rays and work on her suntan which she had been doing in the "home" of my kiwi vine as evidenced in the photo-op below. 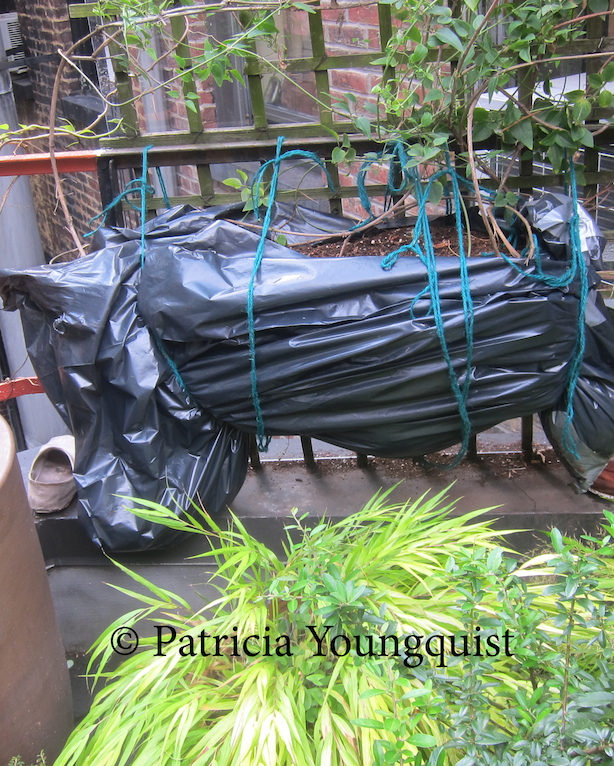 But be that as it may, with the help of my friend Michael, the kiwi was pulled out of its digs, put in a bag and tied to the railing as seen in the image below which you may recognize from a previous post. 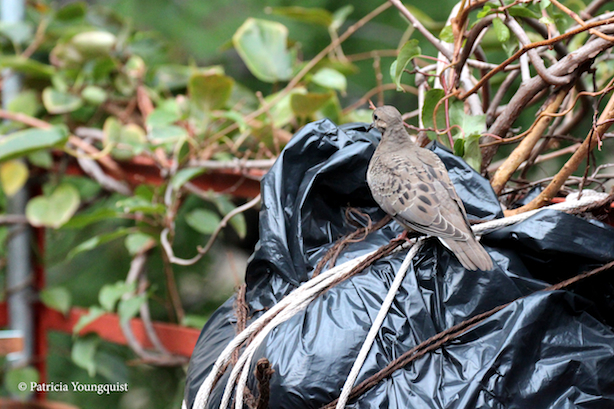 My visiting birds adjusted much better than I did in terms of seeing the kiwi in a body bag, as evidenced by a lone mourning dove who immediately made him/herself at home which you can see in the image below. 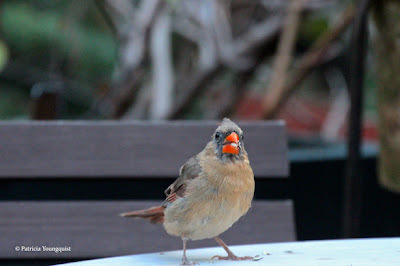 that in the photos below, photos that you may recognize from a previous post. And once again, a mourning dove appeared on the scene to asses the situation re my autumn clematis's empty container, a container that I presume he hoped would have a bit of food remaining in it, as you might surmise from the image below. 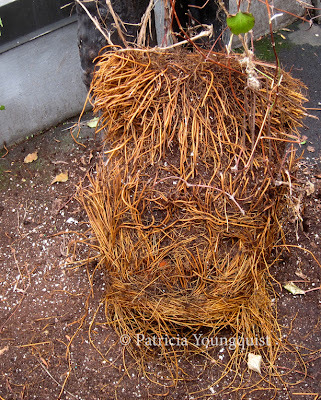 As for my H.F. Clematis, it has been with me for at least seven years and, while it was hearty, uprooting it would prove to be problematic as it was root bound, which is an understatement as evidenced by the root ball (seen below) Michael and I found thee once we "forced" the vine from its container! It is also a photo that you may recognize from a previous post. 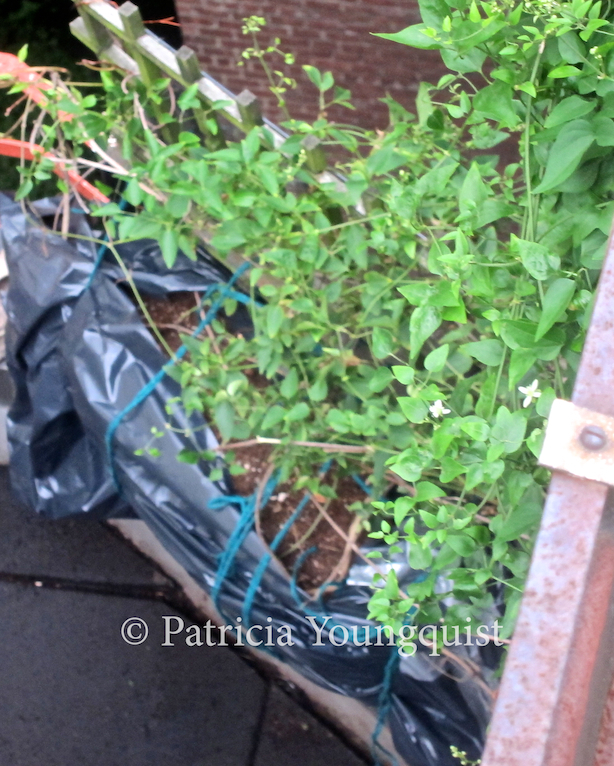 This clematis was then wrapped and secured to the railing as seen below, which is also an image that you may recognize from a previous post. 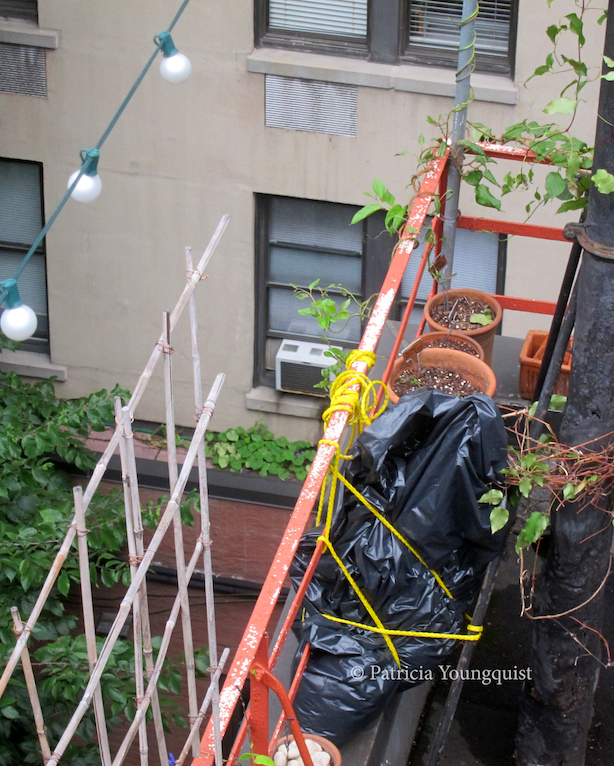 And with the vines being wrapped, and their containers along with everything I grow being either at Michael's garden or in my apartment, I had complied with my landlord's request as evidenced by the aerial image posted below, taken by yours truly, who normally has Juan V do my aerial images, but he was not around when I prepped my garden for the renovation, and so the following is my attempt at an aerial view. As you can see a lone mourning dove was undaunted by my having removed everything I grow from the "floor" of my garden. And with this, I'll conclude my review of the period from September 12th through September 21st of 2012. As you can surmise that was a long eight days for my garden, but at least by that time it was prepared for a renovation as mandated by my landlord. 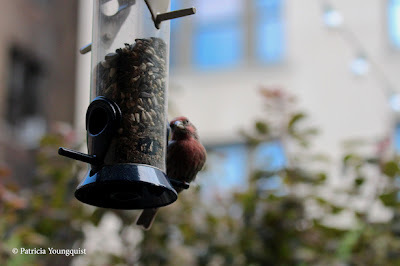 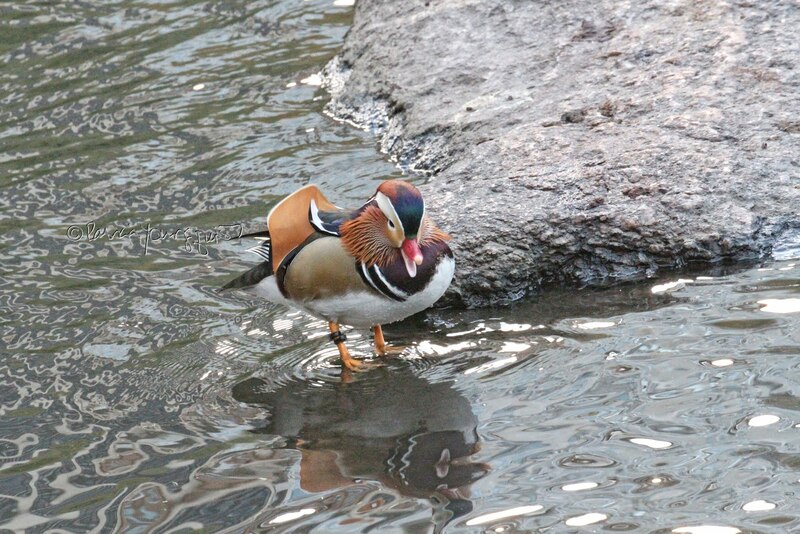 My main hope at that time was that the disruption would not affect the growth of the "things" I have here, and that my visiting birds would adjust to the situation. Please "tune in" tomorrow for the conclusion of my September 2012 garden saga!